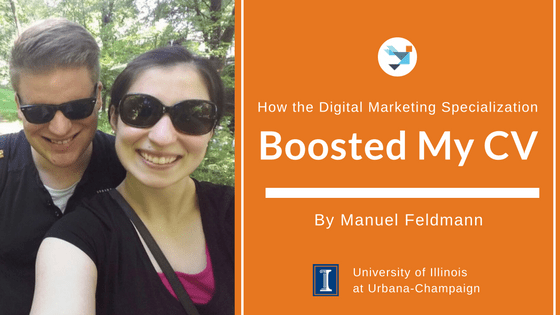 Illinois Community Ambassador Manuel Feldmann discusses his experience with the Digital Marketing Specialization. I started with the Digital Marketing Specialization from the University of Illinois at Urbana-Champaign in May 2015, and I can say in advance that this has helped me a lot in my professional life. I have worked for more than 10 years in journalism besides studying at school and in the university. I was a youth editor at a radio station and wrote articles for print and online medias. During my M.A. study in Political Science and Political Science South Asia at the University of Heidelberg, I began to change my career way in a more marketing and academic direction. I concentrated my Political Science study mainly on modern, political communication and the integration of digital channels. I also wrote my M.A. Thesis about modern election campaign communication in Germany and the integration of social media and other online channels. After completing my time at the university, I began to strengthen my PR and Marketing activities. I started a further study of Public Relations, which I finished in September 2015, also focused on digital communication. 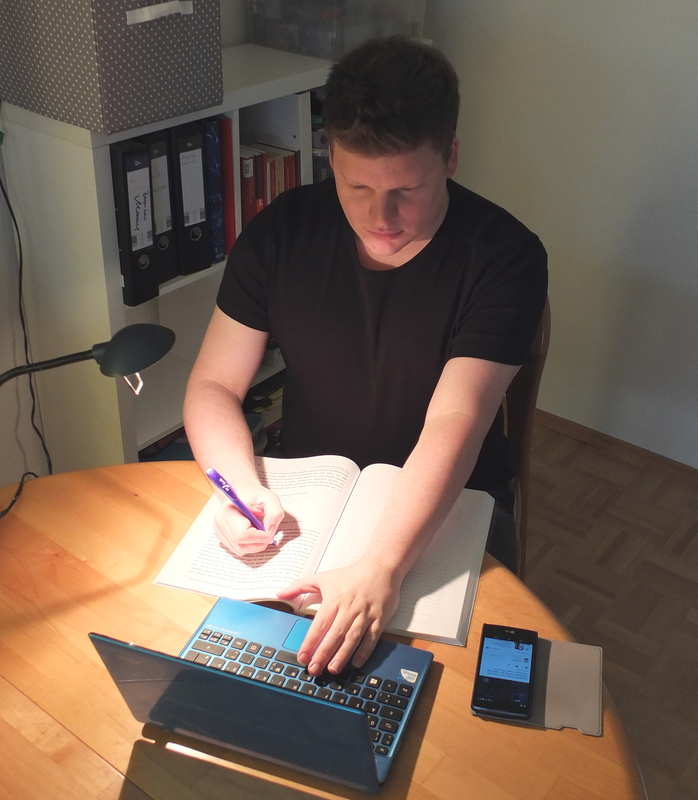 In addition, I became a Hootsuite Ambassador for Germany in February 2015 and received my first online certificate as a Hootsuite Certified Professional. Besides other courses from famous universities, I also started my first one from the University of Illinois at Urbana-Champaign on Coursera called “Marketing in a Digital World” with Professor Aric Rindfleisch in May 2015, which was awesome! Professor Rindfleisch is a very good speaker and does a great job of explaining concepts. 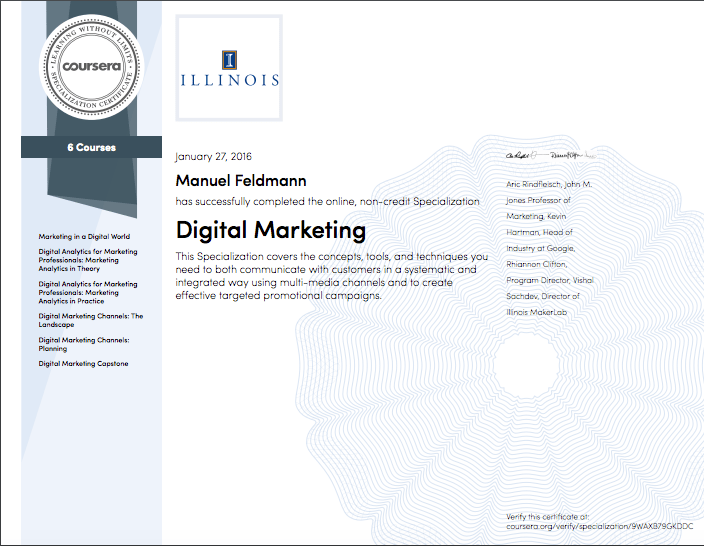 After completing this course, I realized that the University of Illinois at Urbana-Champaign offered further courses in digital marketing, which are also packaged together as a complete specialization. The specialization takes around 8-12 months to complete and is finished with a Capstone project. The Digital Marketing Specialization contains the following courses: Marketing in a Digital World with Professor Rindfleisch, Digital Analytics for Marketing Professionals: Marketing Analytics in Theory, Digital Marketing Analytics in Practice with Professor Kevin Hartman, Digital Marketing Channels: The Landscape, Digital Marketing Channels: Planning with Professor Rhiannon Clifton and the Digital Marketing Capstone project with Professor Vishal Sachdev, Director of the Illinois Makerlab. I really have to say that the Specialization is great. I’ve learned so much in these 12 months about digital marketing, its conceptualization and, above all, its practical application. The examinations are feasible, but a challenge. And, in particular, the Digital Marketing Capstone project with Professor Vishal Sachdev was quite a challenge as well, but I passed it with 93% in the end. The Professors are really great, and I like that they remain active in discussions with the learners in the forums as well. Upon completion of the specialization, I received a request from the University of Illinois at Urbana-Champaign to determine whether I would be interested in becoming a mentor for a course. I immediately took this chance as it came because I was looking for references in this area. In academic practice, experience as a tutor or mentor is so important. So I began as a mentor for the course Digital Marketing Planning the Landscape with Professor Clifton and the Capstone Project with Professor Sachdev. Later, I became a mentor for all other courses in the specialization too. In August 2016, Professor Sachdev asked me if I would become an Illinois Community Ambassador for the specialization. In this function, I can work on the online book club the specialization has together with my great Ambassador colleagues. Moreover, I can publish scientific publications on the blog, support learners, develop new social media strategies and much more. Since I am currently working on my academic career and preparing a doctoral thesis and also trying to boost my career in marketing, all of these positions and functions for the UIUC, combined with digital marketing are goldworthy for me. So you can see, the Digital Marketing Specialization boosted my CV not only in the marketing area but also in the academic field. Therefore, I would like to take this opportunity to thank Professor Vishal Sachdev for the support. I can really recommend the Digital Marketing Specialization, especially if you want to boost your CV through furthering your education. One more tip from my side: tell others that you are doing these courses, write it into your CV. It makes no sense not to communicate your achievements. Be proud of it and then it will really help you on your way. Digital Marketing Project Manager Natalie Papazian for editing the article and for the great graphics. As a mentor for six Digital Marketing courses by the University of Illinois, he supports learners on Coursera. 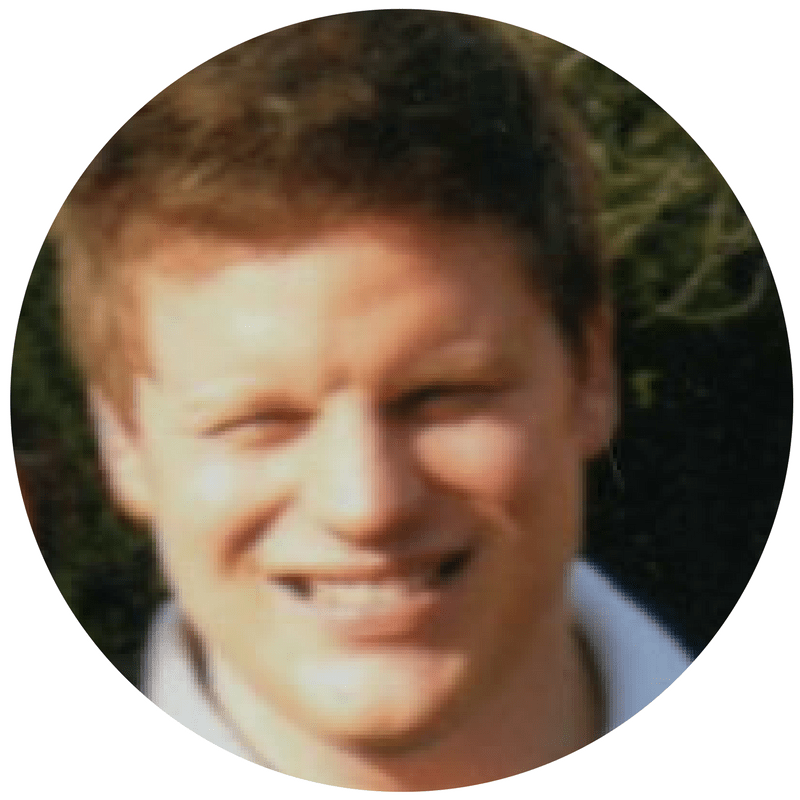 Since 2015, Manuel has been an Ambassador for Hootsuite. 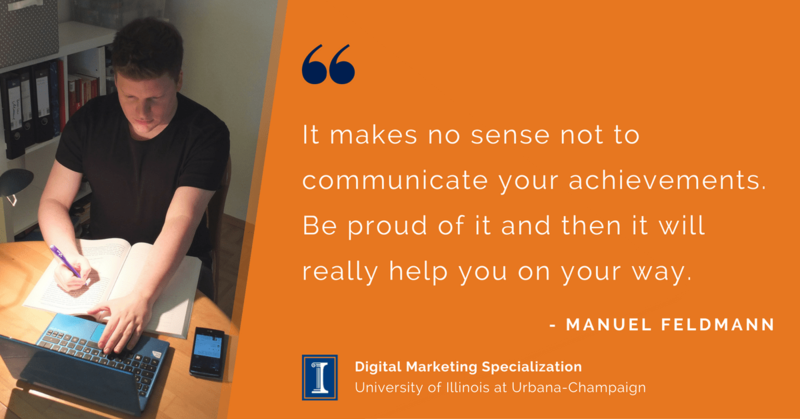 In addition, since August 2016 Manuel has been a Community Ambassador for the Digital Marketing Specialization by the University of Illinois at Urbana-Champaign. He is also preparing his PhD in Political Science.